Be the first to share your favorite memory, photo or story of Carroll "Butch". This memorial page is dedicated for family, friends and future generations to celebrate the life of their loved one. 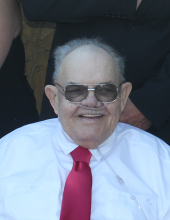 Carroll D. “Butch” Rohrbeck, age 78 of rural Cambria was called to his eternal home on Saturday, March 30, 2019. Butch was born at home on the dining room table, the son of George and Jessie (Krueger) Rohrbeck on February 17, 1941. He attended Healy rural school in the Springvale Township and graduated from Cambria High School, then attended MATC for welding. He was united in marriage to Diane Ruck in 1970 and purchased a farm on Pardeeville Rd., where they raised their five children. Along with hog farming Butch worked for Jaques Seed Company and then with Dean Foods (Del Monte) as a mechanic until his retirement. He enjoyed family, his dogs, racing, sports and restoring tractors. He was a proud fan of Matt Kenseth, Wisconsin Badgers, Green Bay Packers and was a great story teller as well. Butch was a member of the Rio Redeemer Lutheran Church for many years. Butch is survived by his children, Glen (Cambria), former daughter-in-law, Ann (Fox Lake), Laura (Markesan), Michael and Rhonda (Markesan), Michelle (Portage), Jessica and Jordan Silvani (Cambria); his grandchildren, Taya Ballard, Adam and Nolan Rohrbeck, Scott and Kelli Schueler, Austin Schueler, Crystal and Clinton Steinike, Chesney Rohrbeck, Cynthia Kelm, Lydia DeYoung and Sean Baerwolf Silvani; two great grandchildren, Bexley Schueler and Chase Steinike; his sisters, Virginia Berger (Madison) and Shirley Martin (Rio); one sister-in-law, Darlene Rohrbeck of (Portage); nieces, nephews, several other relatives and many friends. Butch was preceded in death by his parents; his siblings, Arwin and Vernon “Stub” and one brother-in-law, Wallace Martin. The Kratz-Smedema Funeral Home in Cambria is serving the family. For more information, to leave online condolences, or to assist the family through Crowdfunding, please visit www.kratzfh.com. To send flowers or a remembrance gift to the family of Carroll "Butch" Dean Rohrbeck, please visit our Tribute Store. Or, if you would like to donate to the family, please visit Carroll "Butch"'s Tribute Fund. Help ease the financial burden placed on the Rohrbeck Family after the loss of a loved one by making a donation. "Email Address" would like to share the life celebration of Carroll "Butch" Dean Rohrbeck. Click on the "link" to go to share a favorite memory or leave a condolence message for the family. Provide comfort by sending fresh flowers from our local florist or donating to Carroll "Butch"'s Tribute Fund.